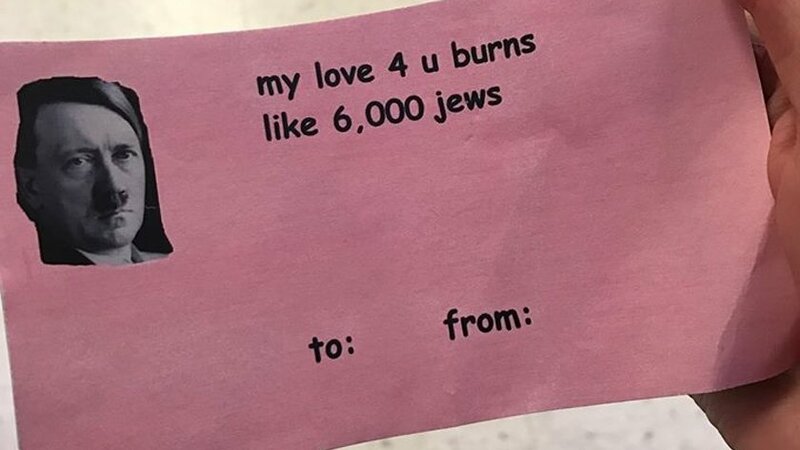 Central Michigan University's College Republicans threw a Valentines event where attendees got gift bags prepared by the university's young, upstanding Republicans, including this one, bearing a likeness of Adolf Hitler and the message, "my love 4 u burns like 6,000 jews." The College Republicans have since apologized. The card was signed "XOXO, Courtney." The group apologised, saying it did not "condone this type of rhetoric or anti-Semitism". "At tonight's [Wednesday] College Republican meeting, we had a Valentine's Day party, in which each member decorated a bag and other members placed valentines inside of others' bags. Unfortunately, a very inappropriate card was placed into a bag without other members' knowledge."